Miettechan and ExileHero's blog. Anime figure photos and reviews! Touhou and Video games too! When I list all the announced figures I want to get for the rest of the year. Except of course that Santa doesn't magically deliver them to me and that I'm the one footing the bill. Last month's list for those interested. Marisa got released a while ago, and I bought her in early May from Play-Asia with a May release. In a couple of days it will be August and I wouldn't be surprised if I still don't receive her. I'm a little annoyed with the limited release of Touhou figmas. Still, whatever troubles I go through to get Marisa is worth it. After all, you can't have a Reimu without Marisa. Oh well, at least she is still cheaper than Reimu at $60 USD. 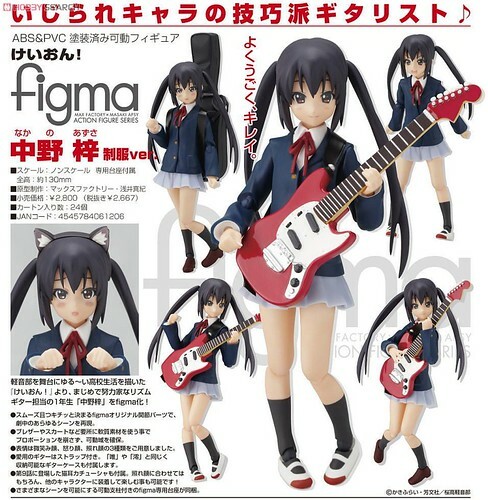 I can't wait for Azunyan, she is all that's left and I get a complete After School Tea Time band. I didn't really like Azusa more than usual when I first watched K-On! Now though that K-On!! has focused more on her she is growing on me. Pre-ordered at Hobby Search for 2,266 yen. I was supposed to have received the BRS figma together with Mio this month but alas she got delayed until August. 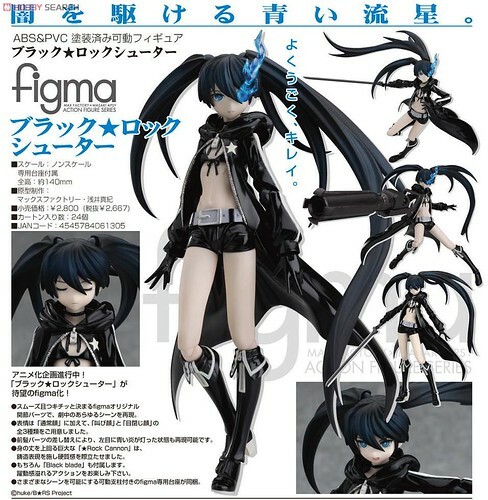 While I like BRS I didn't find her appealing enough to put down the money for one of the scaled releases. The figma though? That I'm more willing to buy. Hopefully with no more delays, pre-ordered at Hobby Search for 2,266 yen. 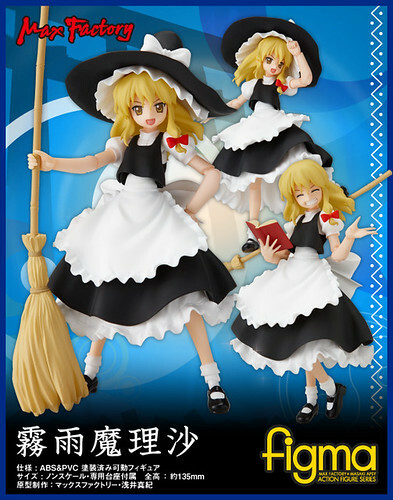 I was wondering what Touhou girls would Max Factory make after the obvious Reimu and Marisa. 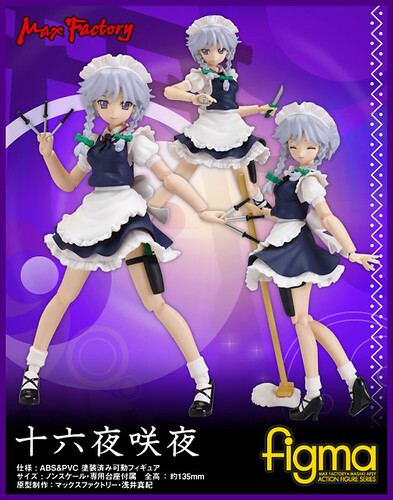 I'm happy that Max Factory went with the battle maid time controlling Sakuya. Out of all the Touhou games I like Embodiment of Scarlet Devil's cast the most so I'm happy when Sakuya was announced. Speaking of which, Max Factory, I want a Cirno, Remilia, Flandre and Patchouli figmas. Sakuya has the listing price of 2,800 yen. I plan to acquire her from an auction site or Play-Asia if she is in stock after her release. Total for August 7,332 yen. Alright once again, go play and buy Valkyria Chronicles for the PS3. Just the other day I played Valkyria Chronicles again and remembered why I like both the game and Selvaria. I don't remember if I said it before but Alter is my favorite figure producer. With that in mind, a character I like from a game I love by my preferred figure manufacturer is a no brainier. 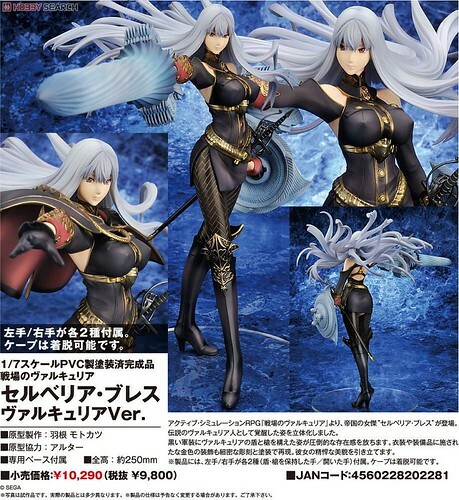 Selvaria is priced at 8,330 yen in Hobby Search. 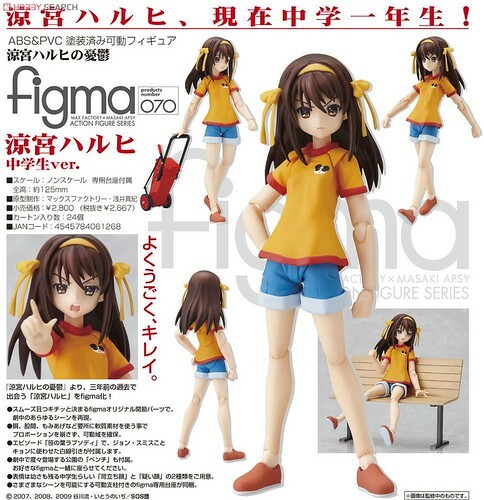 Loli Haruhi will be my fourth Haruhi figma and you know what? I don't care. I should get annoyed at Max Factory for releasing yet another variation of Haruhi as a figma but I'm not. Either way I look forward to getting her and expanding Haruhi's expression repertoire. Plus now I really want a Kyon to accompany Haruhi and orange is my favorite color. Anyways pre-ordered for 2,266 yen at Hobby Search. Total for August 10, 596 yen. While the BRS didn't spark my interest too much Dead Master did. I find her character design really, really appealing and the character both as Yomi and Dead Master was likable for me on the OVA. I'm a figma collector first and foremost when it comes to figures so I'm not passing her up. Pre-ordered for the slightly higher price of 2,429 yen. I own only one Vocaloid figma, Miku, and she is not my favorite by any means. 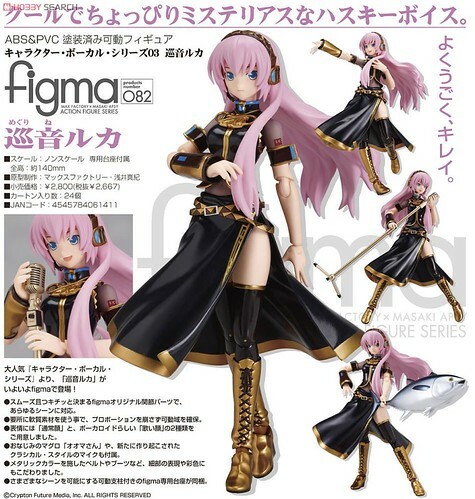 As for Luka I like her design, so I pre-ordered her just in case later on I ended wanting her. 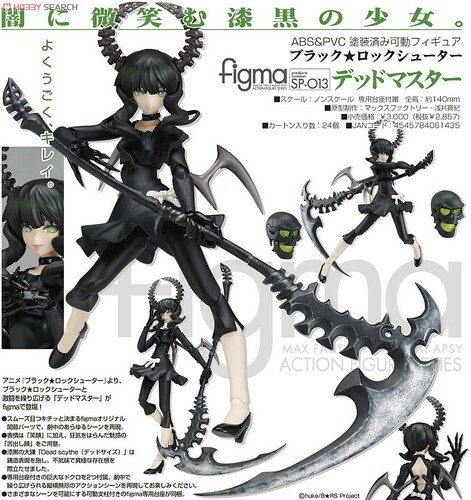 Pre-orderd at the usual figma price of 2,266 yen. Now here is one figure I'm glad I pre-orderd just in case as I seen some already closed. 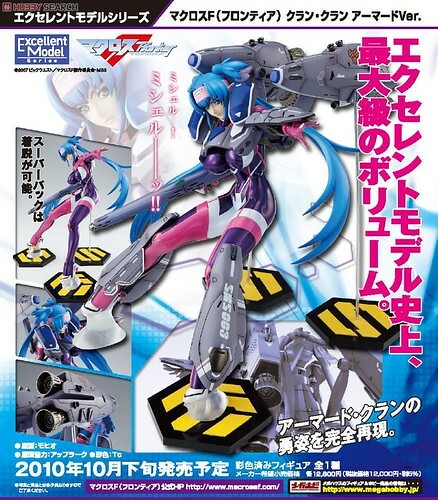 Like I said before I really like the whole mecha musume vibe Klan Klang is giving off with the VF-25 FAST pack. I'm still not sure if I want to get her because of the 10,200 yen price but in case I do she is safely pre-ordered. Total for October 15, 095 yen. 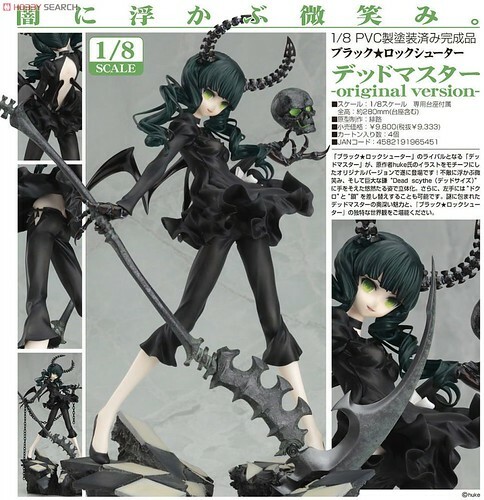 This Dead Master figure caught my eye instantly and just as she went up for pre-order I quickly reserved her. I look forward to both owning her and taking pictures of her. She is the sole release I want for my birthday month at a price of 7,467 yen. Total for November 7.467 yen. When I first heard of the actsta line I was curious about it. The quality of a scaled figure plus the articulation of a figma together in one new type of figure. Then I learned the first release was Subaru from Magical Girl Lyrical Nanoha StrikerS and then followed by Teana from the same show this July. I mean, out of all the possible choices GSC had there surely was other more popular characters to chose. Because of this I didn't payed attention to the actsta line after it was announced. 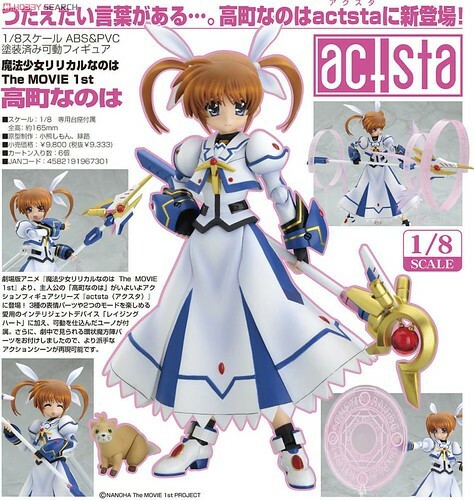 That changed with the recent Wonfes when GSC announced a Nanoha actsta. I'm looking forward to her as she has not only the same accessories as her figma counterpart but even more in the form of the magic circles. Besides as nice good quality release of one of my top 3 2D girls I can't miss it. She is pre-ordered with a price of 7,933 yen, while I feel it's kinda high for an articulated figure I have already payed a higher price for a figma. Now here is a release that I find interesting for three reasons. 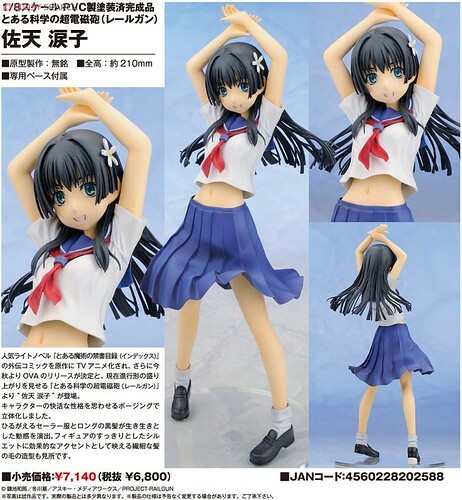 The first is that Saten Ruiko a secondary character from A Certain Scientific Railgun got a figure from Alter. The second that Alter would chose to release her first over say Biri Biri or Kuroko or other Index/Railgun characters. The third, that I apparently liked her character enough to buy a scaled figure of her. Thinking about it the reason I like Saten comes down to two specific episodes from the Railgun anime when she succumbs to effects of Level Upper and when she goes to the make up classes for people who used it. Well, pre-ordered for 5,780 yen. Total for December 13, 713 yen. A pretty large list in my opinion, I really wonder how many will I actually obtain by the end of year.